In the distance, a Land Rover slowly traverses the dirt road which snakes its way through rust-colored mountains. Sounds proliferate: the tires growl on the gravel path, crickets chirp, and songbirds twitter. Belying the exceptional distance at which the vehicle is photographed, men (presumably within the automobile) converse in a clearly discernible register. Subsequent cuts introduce variations in the angle and length from which the vehicle’s progression is monitored, even as the magnitude of the men’s disembodied voices remain constant. Indeed, beside Farzad, a young boy who has been dispatched to retrieve the visitors from Tehran, and Behzad, the driver and “engineer,” none of the others (part of a film crew, as it is later revealed) are shown onscreen with any degree of visual clarity. They will remain to the viewer persons of whom one isa ware, but at the same time, persons whom one does not know by sight. In this way, Kiarostami introduces his viewer to the formal rhetorical strategy of The Wind Will Carry Us within its opening sequence. From the outset, Kiarostami formulates a dialectical relationship between image and sound that ultimately will serve the picture’s discursive ends. The space onscreen can vary from cosmic vantages, such as those of the minuscule Land Rover winnowing its way through the mountain paths, to close-ups of the film’s protagonist that accommodate little depth beyond the subject itself. Concurrently, Kiarostami aurally represents an expanse that extends far beyond what the viewer can see at any moment, even when the camera remains a considerable distance from the persons or things presented on-screen. The space which is represented beyond the limits of the frame therefore is itself multi-planar in much the same way that Kiarostami’s long shots accommodate numerous points of interest within the frame’s limits. Kiarostami establishes numerous spaces beyond the visual field by fragmenting his soundtrack to represent at once, for example, someone talking on-camera to someone off, even as there may be birds singing, dogs yelping, and a distant radio blaring. The limits of the frame are exploded, there is a world extent beyond that which the camera directly reveals. The off-camera space, suggesting a multiplicity of overlapping spaces, is further suggested through the Engineer’s repeated cellular communications. In each of these, he is speaking with someone from a distant, far removed location. The viewer can neither see nor hear the other communicant, but all the same, is impelled to assume the reality of this other and the veracity of the space they occupy. This then becomes the template of yet another of the director’s strategies: to depict presence without [material] presence, a concept essential in order to understanding the film in terms of the spiritual. The notion of presence-without-presence also manifests in the crewmen who are primarily represented as off-screen voices, a man who is digging a ditch for a communications tower atop the hill (that coincidentally the Engineer must ascend each time he wants to answer his phone), and even the dead who occupy the graves that cover this same summit. Each of these, alive and deceased, exists beyond the material limits of the frame. In most cases, their very existence is never confirmed visually. And then there is the subject for the film that Behzad and his crew are preparing to make: the village’s oldest resident, who like the others mentioned, never appears materially in the film or on film, even if she is a constant point of reference for the on-camera dialogue. The film that they are waiting to shoot is one that details the ceremony surrounding the old lady’s death, that is if only the matriarch will finally pass away. Yet much to Behzad’s chagrin, not only does she not die, but rather her health even improves. That this is a point of frustration for the filmmakers provides The Wind Will Carry Us with its droll undercurrent. It also provides the relatively static narrative with an endpoint: Behzad’s attainment of humanity (not unlike Ethan Edwards’ at the conclusion of John Ford’s The Searchers). When the worker is buried alive by the collapsing ditch—which, significantly, the viewer hears as an off-camera sound cue—the Engineer rushes for help, soliciting assistance from the farmers who line the road, offering the children a ride in his truck (in an act of contrition targeted at Farzad whom he earlier snapped at needlessly), and finally returning to the top of the hill in his Land Rover, which the townspeople now use to transport the gentleman to medical assistance. Consequently, Behzad hops on the back of the motorcycle of the village doctor, who proceeds to offer his view on that most essential of questions: what is the relationship between this world and the next? The doctor avers that death is ultimately a far worse “disease” than old age, which Behzad initially decries. He observes that “when you close your eyes on this world, this beauty, the wonders of nature, and the generosity of God, it means you’ll never come back.” In a fashion decisively reminiscent of the taxidermist’s at the conclusion of his 1997 film Taste of Cherry, he defends this life against the next, asking “who has come back from there to tell us if it’s beautiful or not?” “Prefer the present,” he says, “to these fine promises.” Of course, Kiarostami underscores the doctor’s words with ravishing images of the Iranian countryside, thereby tipping his hand, such as it were, to how he himself is likely to regard the issue. However, Kiarostami’s film, like all of his major work, is characteristically open to interpretation. What is at issue, in fact, is no less than the question of the soul, and consequently what follows this life. (In this way, The Wind Will Carry Us becomes a fascinating follow up to Taste of Cherry, which dealt with the exigency of suicide). The thematic application of its central concept of presence without presence would seem to convey a sense of the immaterial in a medium which is fundamentally material. 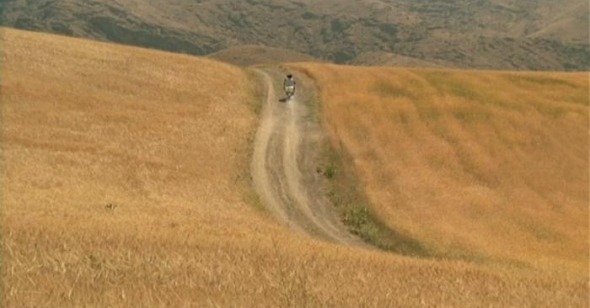 Put another way, by referring to characters which the viewer does not see, and in some cases does not hear, Kiarostami is evoking a world not just beyond the material limits of the frame, but by implication, beyond the material. Clearly, Kiarostami reminds his audience that the world is much larger than that which can be communicated in any single work of art, be it in terms of its thematic scope or separately, in the physical space of the film itself. Here, it can be observed additionally that his systematic use of extreme long shot serves to contextualize the depicted object within the space of the larger world. To be sure, the film’s denouement seems to assert the fundamental interconnectedness of the modern world (which is underlined of course by the repeated use of telecommunications) and likewise, the situation of the individual within a broader social context. Symbols of death proliferate throughout The Wind Will Carry Us: the graveyard, the imminence of the old woman’s passing, the ancestors that Farzad mentions in an early conversation with the Engineer, the exam question that the boy cannot figure out (what happens to the good and the bad on the day of judgment? ), and the femur that Behzad leaves on his dashboard. All of these things seem to impel the viewer to consider the parameters of the afterlife, to say nothing of immaterial existence more generally. Indeed, in the film’s opening sequence, Behzad tells Farzad that like all people, cars too have ghosts. This becomes the explicit theme of the work, once the viewer discovers the subject for their film—they are waiting for the old woman to give up her ghost. The viewer is asked therefore to consider what it is that constitutes the soul, and what similarly happens to the soul after death. Kiarostami sees his function as that of one who raises questions, rather than the person who answers them. In a very real sense Kiarostami affirms that the above questions are ones that everyone must answer for themselves. To be sure, Kiarostami, in spite of what is ultimately a humanistic (and decidedly terrestrial) response to the questions raised, all the same proceeds from a position that respects such immaterial concepts as the soul and an afterlife. Cinema, because of its material ontology, is seemingly predisposed to eschew questions that are spiritual in origin. At times, the very concept of the spiritual seems to be contradicted by the medium itself, given that it has no inherent means to confer the metaphysical. This too is a place where Kiarostami’s contribution cannot be underestimated. In no way would it be overstating the case to say that The Wind Will Carry Us provides a template by which a filmmaker can communicate metaphysical reality. The limits of the frame, the material representation of a space in dialogue with another that is not represented physically become metaphors for the relationship between this world and those which may exist apart from it. By limiting the space of the mise-en-scene, Kiarostami expands the space of the art. While this work exemplifies a certain conception of spiritual representation on film, this does not exactly account for its connection to those artists that Kiarostami mentioned. Fellini aside, the mature work of these filmmakers share a similar pacing with The Wind Will Carry Us; in films like Flowers of Shanghai, Stalker, and The Traveling Players, the relatively slow or deliberate movements have the potential to affect the viewer on a supra-emotional level, which is to say in manner analogous to music, that the viewer’s physical processes can be affected by the excessively slow rhythms, on a level beyond the intellectual or emotional—it’s almost possible to conjecture that one’s heartbeat and breathing slows in concert with the languid images onscreen. The viewer’s experience of the film thus is less mediated, his or her connection more direct, and in this way perhaps more spiritual. The film’s languid pacing also provides the viewer the time and space to consider the issues raised by the film—not only with the questions that they must ask themselves, but also with the time and space to engage in self-critique. In this way, as in so many others, The Wind Will Carry Us sustains an organic relationship between the film’s form and its content. Indeed, this is the very significance of Kiarostami’s film: it connotes a reconstitution of the medium according to the particular meaning its maker is attempting to convey. In this respect, Kiarostami joins another of the cinema’s great spiritual filmmakers, Robert Bresson, whom Kiarostami has suggested was the model for the sound structure of The Wind Will Carry Us. Likewise, each evokes a world beyond that which exists onscreen. Where they diverge is at their respective endpoints: whereas Kiarostami’s is a cinema of proliferation and layering, a cinema of the maximal (to paraphrase Jonathan Rosenbaum), Bresson’s, in contrast, is a cinema of radical austerity, a cinema whose surfaces are emptied of their expressive capacity. That each attests to the metaphysical is a credit to the medium’s dexterity.